Synopsis (from Amazon): In the Jubilee Bible 2000 (JUB), the usage and context tends to define each key word so you don’t need to depend on theological dictionaries or reference materials. Careful attention has been made to properly translate the first usage of each key word and through to the last occurrence. Then, as the word makes its way across the Old Testament and you make the correct match with the corresponding Greek word in the New Testament, an amazing pattern emerges. 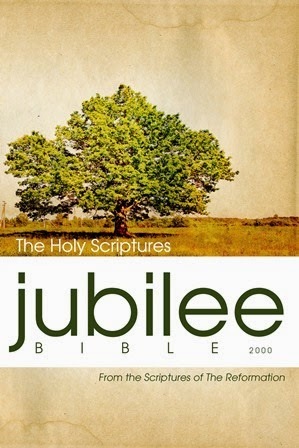 The Jubilee Bible is the only translation we know of that has each unique Hebrew word matched and mated with a unique English word so that the usage (number of occurrences and number of verses where the word occurs) sets forth a meaningful number pattern and a complete definition of what God means by each word. For a while I've been collecting bibles in multiple translations for cross-reference. From what I can tell, the Jubilee Bible is like the hybrid of KJV, ESV, and the Amplified Bible. I thought this translation was interesting. It was accurate and it's clear that the translator put a lot of effort and work into bringing a dead language back to life. For the student or intermediate level this could definitely be a good resource. However, the beginner may need a more paraphrased, comprehensive approach to understanding and interpreting the scriptures. The format is also different than usual. For instance, each chapter is labeled with the name of the book and the chapter number. It is not red-letter, and quotations are nonexistent. Keywords are often italicized at random points that make the flow of reading become interrupted randomly. I tried to research as much as I could on this version of the bible to compliment and ensure accuracy for this review, however, it is very difficult to find any scholarly information or comparisons on it. I was hoping I could shed some light on this gap, but so far I have been unable to do so. I do attend a Christian University and live in "The Bible Belt," so I may pose some questions to my professors and add on to this review in the future. There is significant information in the first several pages in regard to the origins of it, and the editor obviously went to extensive lengths to ensure the reader has a foundation of understanding as to what his intentions were. I will be keeping it as another bible for cross-reference.